Blue and White chairman confident he is prepared to step into the role of PM, says US-Israel relationship must be kept bipartisan. 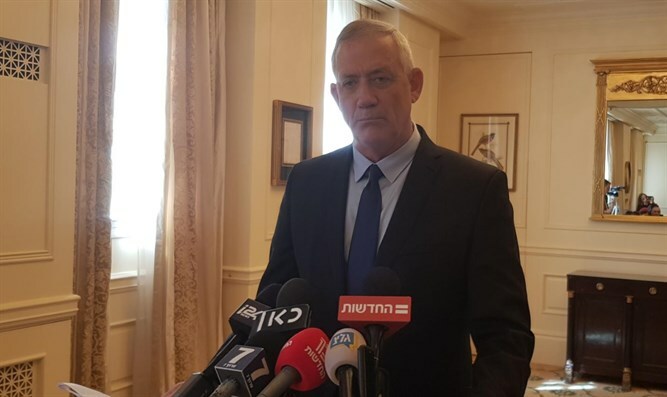 Blue and White chairman and former IDF chief of staff Benny Gantz spoke with reporters Sunday, following his arrival in Washington DC ahead of his planned address at the American Israel Public Affairs Committee conference. Gantz, who is currently leading Prime Minister Binyamin Netanyahu in polling for the April 9th general election, told reporters he could “easily” assume the role of prime minister if he defeats Netanyahu next month, claiming he has as much experience as Netanyahu had during his first term as premier in the 1990s. “Is my starting point anywhere worse than what was Netanyahu’s 13 or 15 years ago? Do I have less experience than he had 13 years ago? Do I not have a great partner with me to do this,” Gantz continued, referring to Yair Lapid, the second candidate on the Blue and White List. Gantz also discussed President Donald Trump’s plans to formally recognize the Golan Heights as Israeli territory this week, rejecting suggestions the move constituted “interference” in Israel’s upcoming election. Gantz also said Israel must be careful to ensure that its relationship with the US remains a bipartisan one, with strong support from both Republicans and Democrats.